Worsted weight yarn in two colors, plus a small amount of black yarn for the eyes and mouth. Rnd 4: *2sc in 1st sc, 1 sc in ea of nxt 3 sc* around (23). Rnd 5: *1 sc in ea of nxt 6 sc, 2 sc in nxt sc * around. (26). Rnd 6: *1 sc in ea of nxt 6 sc, 2 sc in nxt sc * around. (30). Rnds 7-12: Sc in ea sc around. 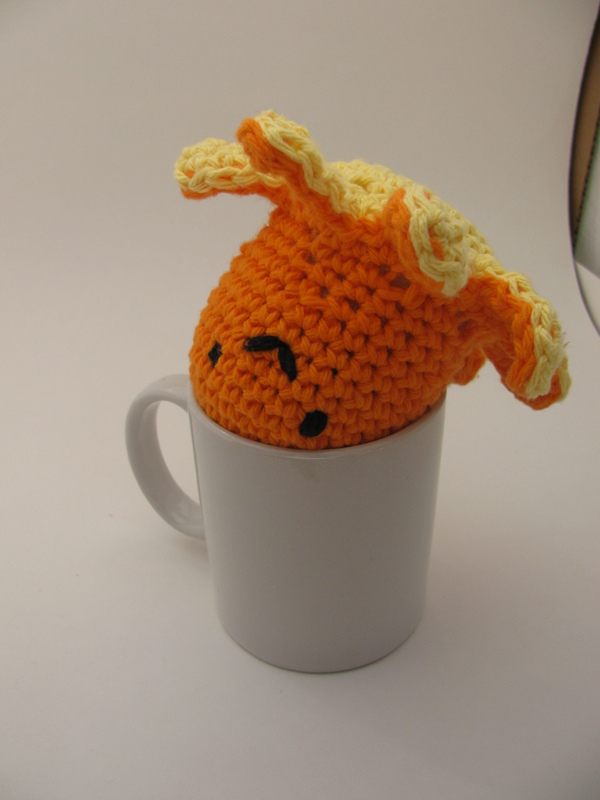 Although you can wait until you finish the top to do this, I find it easiest to pause in the crochet work here and sew on the eyes and mouth. I usually do the eyes around row seven and the mouth around row nine. Rnd 15: To make arms, *Sc in nxt 2 sc, ch 7, working back down ch starting at 2nd ch from hook, sc 6, sc one more on original round* for a total of 8 arms. Rnd 16: Sc in ea sc around, adding 2sc in 1 sc space at top of each arm. Sl st and tie off, leaving the yarn long (at least 1 yard) for sewing top to bottom. Rnd 4: *2sc in 1st sc, 1 sc in ea of nxt 2 sc* around (24). Rnd 5: To make arm bottoms, *sc in nxt 2 sc, ch 7, working back down ch starting at 2nd ch from hook, sc 6, sc one more on original round* for a total of 8 arms. Rnd 6: Sc in ea sc around, adding 2sc in 1 sc space at top of each leg. Sl st and tie off. Sew top and bottom together. 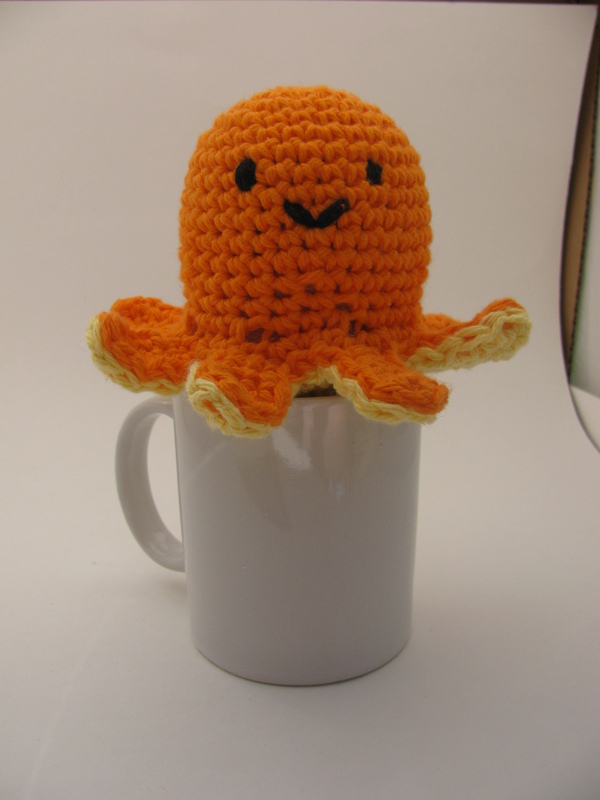 When you have one arm left to sew, stuff octopus. Finish sewing, tie off, and tuck in end of yarn. Taa-daa! 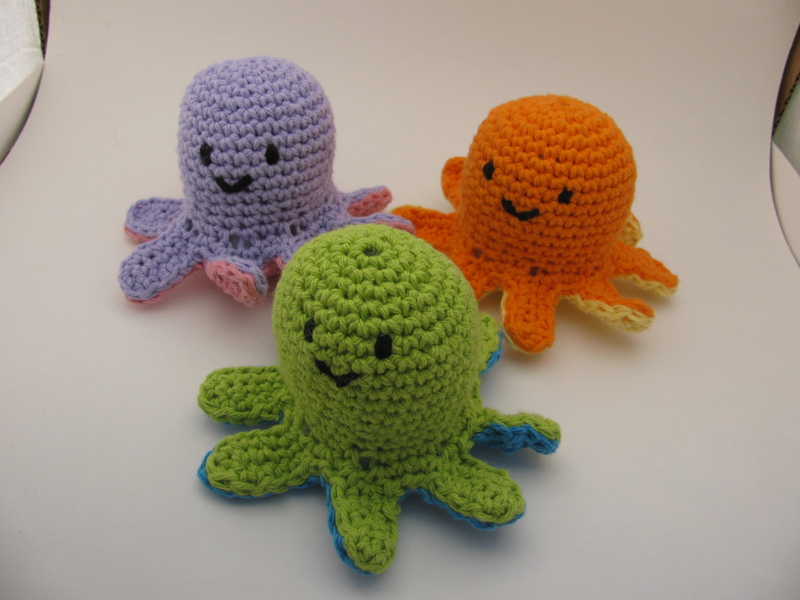 A cute little octopus, all your own. 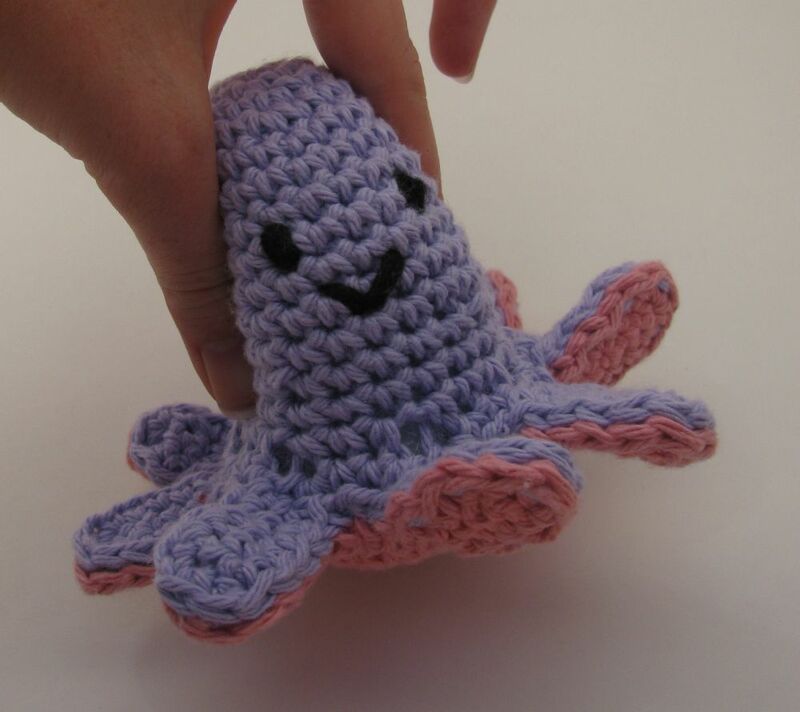 A squishy little octopus for you to love. If you try this and have any difficulty, I’d appreciate it if you’d leave a comment so I make corrections if needed. 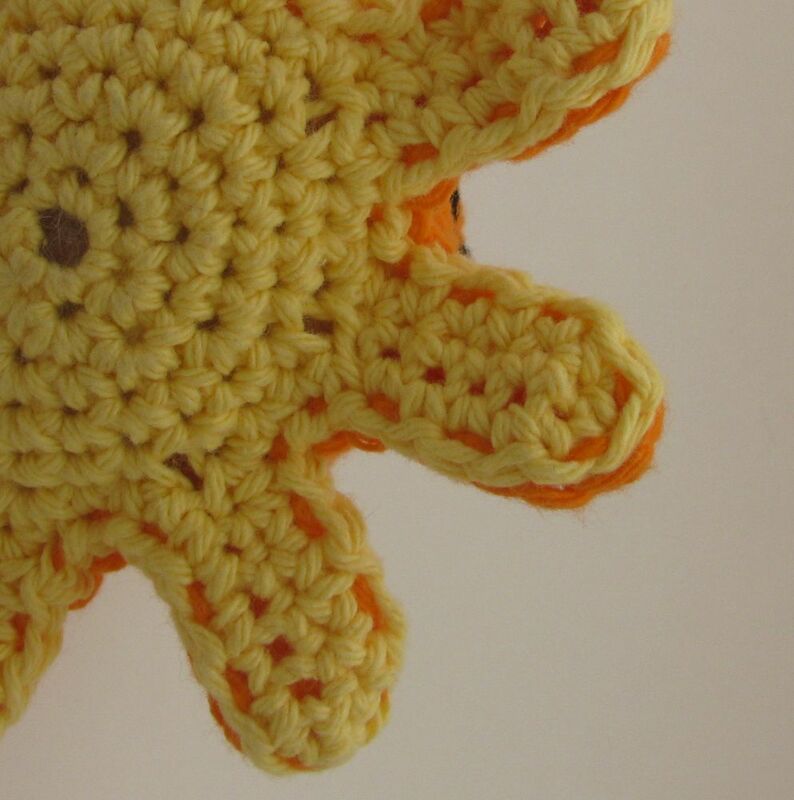 This entry was posted in Crochet, Patterns & Tutorials, Things I Made and tagged beach, creatures, Crochet, octopus, sea. Bookmark the permalink. Very very cute, especially the contrasting colour underneath.